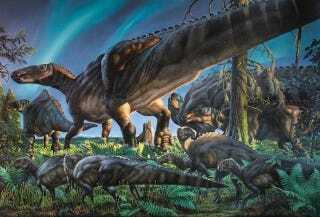 The image of a dinosaur tramping around in the snow feels totally wrong — these behemoths ruled a tropical world. But one duck billed dinosaur, at least, managed to endure long, dark winters far north of the Arctic Circle some 69 million years ago. Meet Ugrunaaluk kuukpikensis, the northernmost dinosaur known to science, whose skeletal remains were recently unearthed in a remote region of northern Alaska. The 30 foot long herbivore, described by Florida State University researchers in this week’s issue of Acta Palaeontologica Polonica, is causing paleontologists to question everything they knew about the massive reptilians that once roamed the planet. To be fair, back in Ugrunaaluk kuukpikensis’s day (we’re really going to need to come up with a nickname for this one), Earth’s climate was much warmer than it is now, and Arctic Alaska was covered in forest. But it wasn’t exactly sweltering up there. The average temperature hovered around 43 degrees Fahrenheit, and in the winter, the region probably saw a decent amount of snow. What’s more, at 80 degrees north latitude, winter means long dreary months of nearly complete darkness, so ol’ kuuky had to contend with that challenge, too. Most modern reptiles can’t handle the cold at all because they lack the ability to regulate their internal temperature. But we’re still not sure that dinosaurs were cold-blooded. If the animals had some physiological mechanism for staying warm, it would help explain why we’re finding them in the permafrost. Which raises another fascinating possibility: Entire communities of cold-hardy, arctic dinosaurs that we’ve simply never bothered to look for. There’s an entire group of ice dinos. These really are amazing times.